There are several thrushes that migrate through North-central Texas in spring. The catharus thrushes present certain identification problems for birders in the field. The Wood Thrush is not a catharus thrush, and because of the very bold spotting on the breast, I don't include it here as a identification challenge with the other related species in the study area. 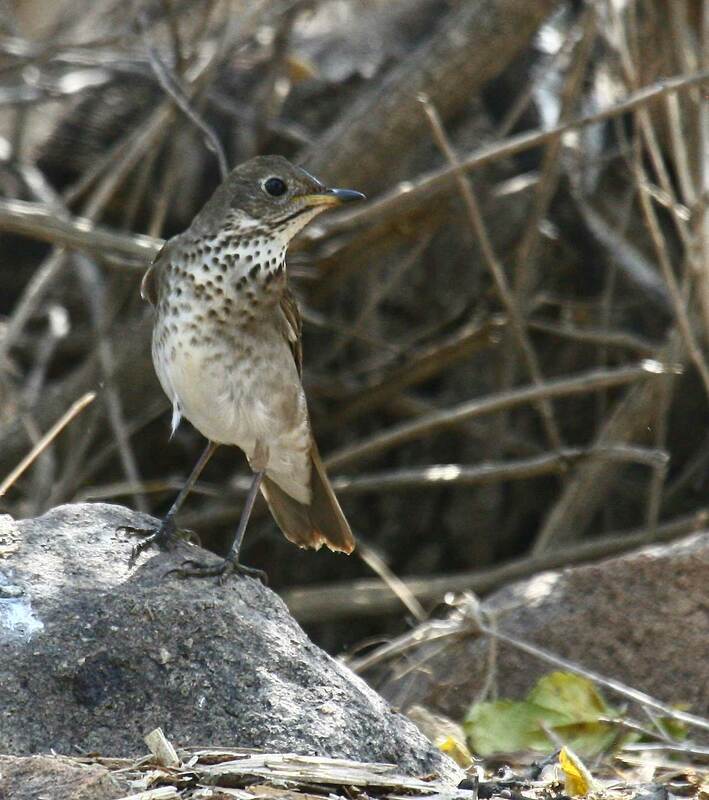 The only catharus thrush observed in winter within North-central Texas is a Hermit Thrush. It is generally not observed with other catharus thrushes during spring migration as it has generally moved out by early April. It also has a significant color change on the tail, so that when seen from the rear or side, it is a rather easy bird to identify. The three catharus thrushes that generally pose the biggest challenge in the field during spring migration are Swainson's Thrush, Gray-cheeked Thrush, and Veery. The Swainson's Thrush is by far the most common spring migrant of the three. On some spring days, it can seem that Swainson's Thrushes are everywhere one looks. It is a fairly easy field ID if the face can be seen since they have very large spectacles that run into the lores. It is not illustrated here since study skins don't show that field mark around the eye very well. I have added a photo below. Swainson's Thrush - Photo by Peter Assman. Veery and Gray-cheeked Thrush are rare in spring and pose the bigger challenge. Birders in the field usually confuse Swainson's Thrush with one of these two species. The color difference between the VEER and GCTH (and even between Swainson's Thrush) are fairly significant as seen above. Swainson's Thrush is generally intermediate between the two species illustrated above. Veery and Gray-cheeked Thrush are each at one end of brown spectrum. Veery is largely a warm, reddish-brown while Gray-cheeked Thrush is largely gray-brown. However, the natural color these two species can be difficult to see in shaded habitat. The underside also shows a difference. The Veery (L) has marginal spotting on the upper breast, but it bleeds into a pale buffy wash and disappears quickly as one moves down the breast. Gray-cheeked Thrush (R) and Swainson's Thrush are nearly identical and show darker spotting which extends further down the breast. Neither the Veery nor the Gray-cheeked Thrush show the very significant facial spectacles of a Swainson's Thrush. Status and Distribution for North-central Texas - Both Veery and Gray-cheeked Thrush are rare spring migrants in North-central Texas. They are not generally observed during fall migration. Wood Thrush is uncommon in spring and rare in fall. Hermit Thrush is mostly an uncommon winter resident and is generally gone from the study area by mid-April.